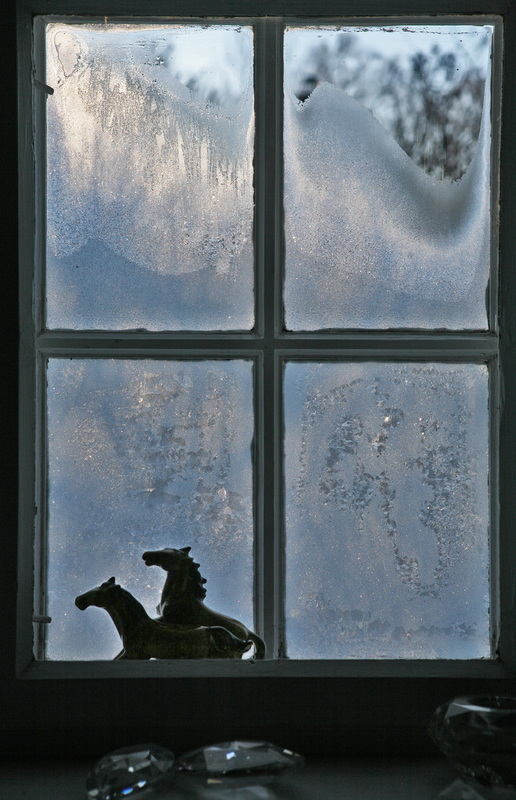 All the south-facing windows in the living room currently have frozen condensation on them. 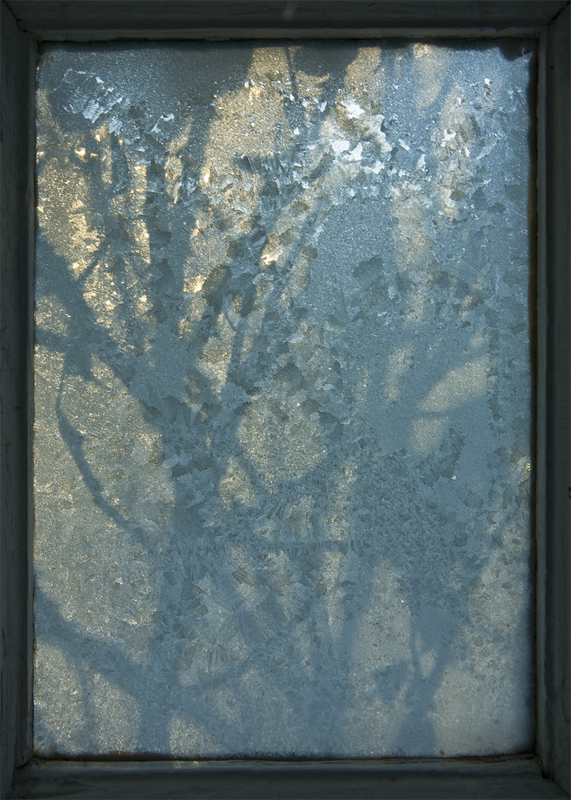 We should probably put in insulated glass, but we like it the way it is: warped old panes of glass that very slightly distort the image of the outside. You can’t buy them any longer; nobody wants distorted images of the outside world except us, apparently. I’m going to cut back the roses in the spring. In the meantime, they’re one of the few green things left outside. This is how it is outside; quite pleasant to look at, but bitterly cold when there’s a wind. Beautiful images, with the sights of the outside world slowly coming through the window: first only the shadows, then gradually, through the molten surfaces, also the forms. It reminds me of a story of Ray Bradbury about “slow glass” through which the light passes for several years, so it is suitable for conserving memories. And I also like the horses. 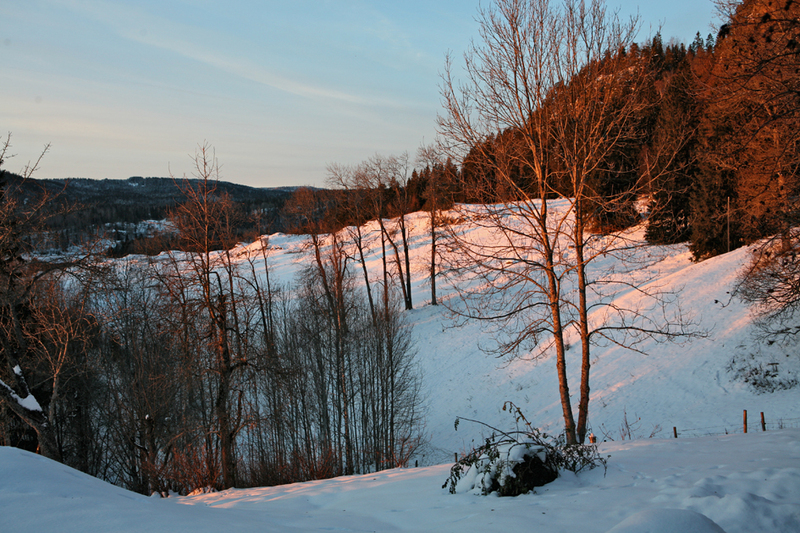 Here we haven’t hit the freezing point yet — well, OK, maybe one night there was a frost. I’m looking forward to some real winter, trying to be patient. It’s both heartening and confusing, this late-blooming rose. Our windows weren’t warped, but they were singly layer. We used to put up acrylic plates to make an insulating layer. At least on the North side. Thank you very much, Studiolum. I’ll have to look out for the Ray Bradbury story, my wife works a lot with glass. The horses belong to my daughter, of course, and I like them too. Her living horse is outside during the daytime; they don’t like to be inside, but I’m surprised they don’t freeze. Empty, I love to see those late-blooming roses. There’s one lying in a heap in the middle of the bottom picture. There’s a big difference in the weather between the northeast & Norway at present. My mother was telling me there’s been an Indian summer in New York, whereas anything close to above-freezing temperatures here seems ages ago. Sili, I remember that business with the acrylic sheets from living in New York. We have inner windows of glass here, that you can’t see in the photograph, otherwise we’d be freezing to death. 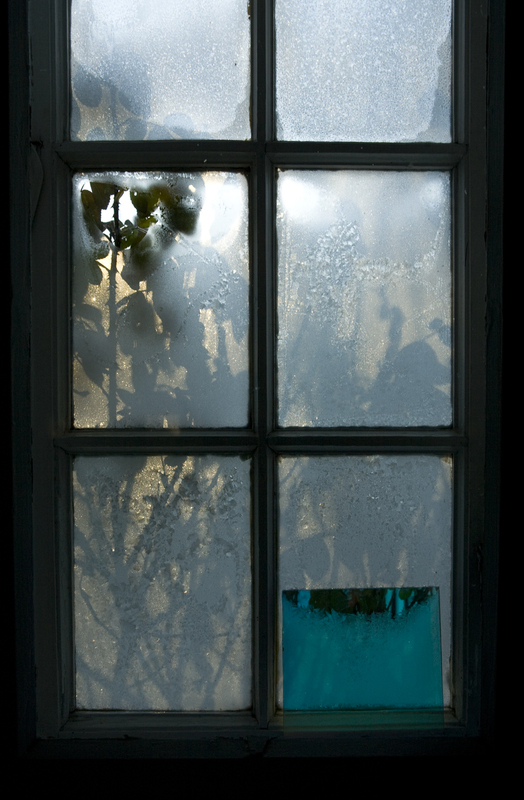 Our windows aren’t warped, it’s just that the old-fashioned way of making glass wasn’t as perfect as modern float glass. It’s pretty bitter here too. A few days ago when the cold snap was forecast, my wife went down the garden to bring in a last few summer flowers for the kitchen table. She got a cosmos, some sprigs of valerian and two sweet peas. They’ve perished now, so today she brought in some chrysanths. Meantime, a squirrel has decided to entertain us by acrobating in the neighbour’s yew that overhangs our garden. Our pheasant has not visited us for a fortnight. Our cats are increasingly reluctant to go out, preferring to snooze on the goatskin. And we are wrapped up like Michelin men. Beautiful pictures through the glass, and it looks so comfy inside! Here we have had a tiny bit of snow, but it has turned to raining on and off. I hear that there is a lot of snow in Europe though. I am going there in less than two weeks. In French the “Michelin man” has a name: Bibendum (pronounced as if written in French “bibindom”). Nothing to do with the meaning in Latin, only the sounds of the name seemed appropriate to the rotund tire man. .
@m-l: Thank you. I never knew he had a name. This wiki article explains its origin. 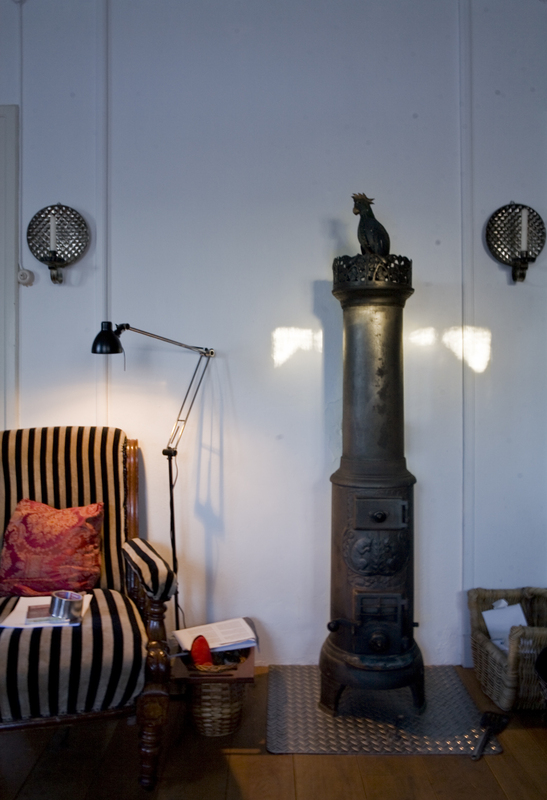 a cast-iron wood stove located in the centre of the house ► How do you manage not to get suffocated by the carbon dioxide (or monoxide) produced by the stove? The photos of your window panes look like little framed paintings. You are an artist, Mr Crown. It’s very nice to hear from you all! Siganus is right :-). The pictures are wonderful (and so strange for me). It is another world. No doubt. Remember the killer in The Silence of the Lambs? ‘He covets, Clarice.’ Well, the horses are good, but I covet that anglepoise lamp. Principal, I could send you one! They aren’t at all expensive, they come from IKEA. I can’t remember exactly, but it cost about £40, I think (everything costs about £40 at IKEA, except the things that cost £100). Have you saw this post from pinhut? The wonderful, cream-tiled, art nouveau Michelin garage in Fulham Road, in London, was always known as Bibendum and was subsequently turned into a restaurant of that name, see here; it has the Michelin man on the outside. Bibendum’s also, apparently, the name of a multinational wine wholesalers. Thanks for the French pronunciation, m-l, I didn’t know that. Sig; How do you manage not to get suffocated by the carbon dioxide (or monoxide) produced by the stove? In back the stove is connected to a chimney, in the wall behind it, that extends above the rooftop. The room has two 10 cm Ø vents at the top of two opposite walls to provide cross-ventilation, but despite that I still find the atmosphere quite soporific. I wouldn’t want the door shut. I’m wrapped up like the Michelin man too, by the way. Well! Today the temperature soared a tickle above zero (Celsius) and it felt positively springlike after the past week. Winter cuisine report: John McCann’s Steel Cut Irish Oatmeal is a disappointment: not good porridge, and a preposterous fuss. This is better stuff – http://www.oatmealofalford.com/ – but standard supermarket porridge oats do pretty well anyway. As do the Jumbo Oats from our local health food co-op. Conclusion: it really is porridge weather. P.S. we’ve got only two-and-a-half jars of marmalade to see us out until the Seville oranges are in the shops again. We’re facing a Toast Emergency. I asked my wife yesterday if she knows why we’re keeping a pair of binoculars next to the toaster. They’ve been there for some time now. Is it in case we can’t find the bread? I don’t know, but I’m not moving them. Speaking of wives, Artur, thanks for answering the question put by mine. I think the windows are excellent. They make all the world “outside” look like it’s happening in a Dreyer movie. I now see it’s not obvious from the front. If you look from the side as I’m doing now there’s a flue half way up that goes into the wall. Thank you, I’m glad you like our windows as much as we do. It’s now down to -17 C., or… 1 F. Which is bloody cold. It’s good to know the Crown family is not likely to choke. But what about fire? Since you have a wooden house you need to be particularly careful when it come to burning-hot pipes running in between walls. And I imagine having two holes for ventilation must create a kind of cold draft in the room, as if a ghost was permanently there. 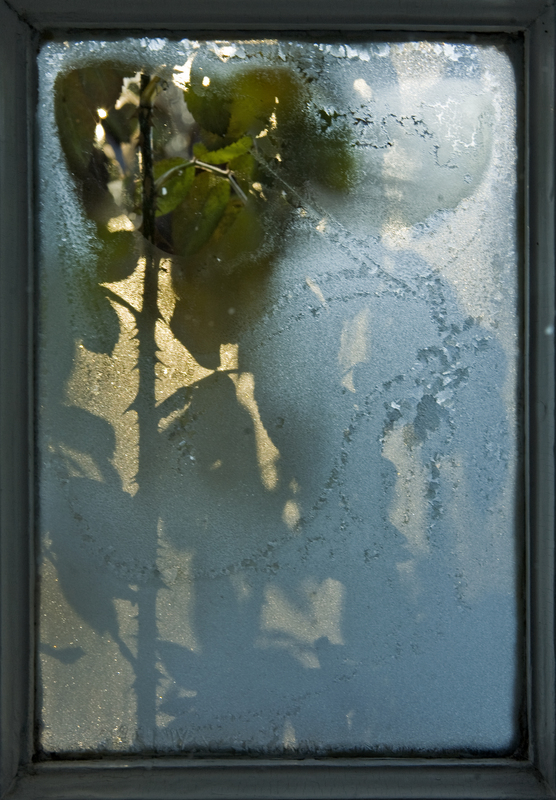 My mother and my father used to fight every now and then about opening windows in winter. Funnily enough, today I can’t remember for sure who between the two of them always wanted to leave them open. How do you bring the wood in and how do you get the ash out? It must be a hell of a painful and dirty business during wintertime. I like that you’re worried about us, Sig. Thanks. The ceramic flue is enclosed inside a brick chimney, which has a (steel) cleanout at the bottom. The chimney is swept once a year by a chimney sweep. The brick chimney is braced against lateral loads by two 2-storey brick walls in an L-shape, in plan, about one metre long. Although the house has wooden joists, there is a detail they use here (& in the US and probably other countries, I don’t know) to frame them out so that they don’t touch the chimney brickwork. Wooden partitions don’t touch the chimney, either: you can see in the photo the small vertical mouldings that cover the joint between the plastered brickwork behind the stove and the adjoining wooden partitions. We keep a fire extinguisher on the staircase & we have smoke alarms on both floors. In general Norwegians are rightly paranoid about fire burning their houses down; a combination of trial and error and foresight means they are pretty safe nowadays. We keep firewood in a small shelter close to the front door; we bring it in daily and we keep it in a basket next to the stove. The ash falls into a tray beneath the flames, and every couple of days, when it’s no longer warm, I take it out and put it in the garbage; the ash is of no particular use to our garden. It’s not very dirty: I vacuum up any dust afterwards & wash my hands, that’s all. You’re right about the vent holes. I like to keep them open and my wife likes to close them. Wood heat is neither painful nor dirty. Rather it is warm, comfortable and simple. Timely efforts are rewarded by heat. Other types of heating move efforts and effects to nimby. Oh, that’s very kind AJP. They’re just building an IKEA here, so that’ll solve my problem. The ones we can get now all come with a ghastly ‘twist’, like ye olde pisselegant cast-iron model for 9 billion baht. Re the soporific atmosphere: On their European tour Wordworth and Coleridge unleashed the inner jingoist by roundly denouncing the even heat given out by these stoves on the flimsy grounds that they made the rooms ‘stuffy’, not like the Great British Drafty Fireplace, which if it doesn’t kill you makes you stronger. Coleridge became a bit of an old fart, disappointingly. Well, it seems that’s what two quarts of laudanum a week on top of a heavy dose of Anglicanism will do to a fellow. Johnson, however, seems to have managed both habits rather better. I’m sorry. I hadn’t read the link of empty.